James H. Lane (1814-66), Brigadier General & U.S. Senator (Indiana/Kansas). Raised a brigade of "Jayhawkers" known as the "Kansas Brigade". 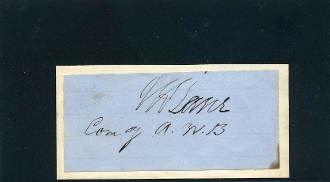 War time clip signature with rank Comdg. A(rmy) K(ansas) B(rigade). Rare thus. Mounted. VF.